Achieve incredible clarity, balance and volume with Guild's jumbo-shaped F-40E, proudly made in the USA in Southern California. Featuring a solid Sitka spruce top and solid African mahogany back and sides, this jumbo acoustic checks all the boxes for players who prize outstanding projection and enhanced mid-range. Its predecessor, the F-48 Navarre, was only produced from 1972 to 1976 and original versions are a rare treasure. Today’s reissue manifests the same vintage charm with timeless and tasteful appointments such as a tortoiseshell pickguard, white ABS binding, and Guild’s peak logo inlaid on the headstock. 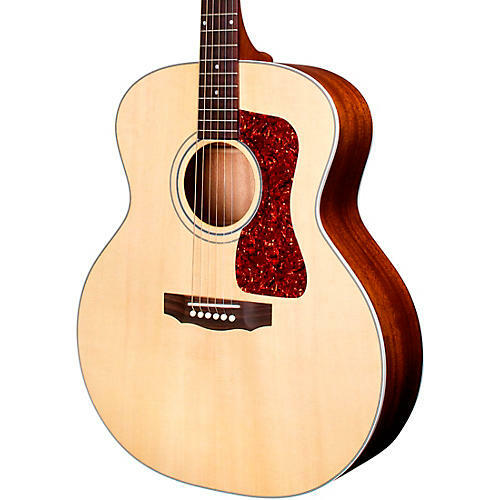 Premium materials such as an East Indian rosewood bridge and fingerboard, 20:1 open-gear tuners, and a hand-cut bone nut and saddle all match today’s standards for fine acoustics. A satin varnish finish gives this guitar its familiar broken-in look and feel, while allowing the tonewoods to “breathe” and reach their sonic potential. Each F-40E ships with a Guild archtop wood case with a built-in Humicase humidification system. Grab this Guild today with a quick click or call. Order now.